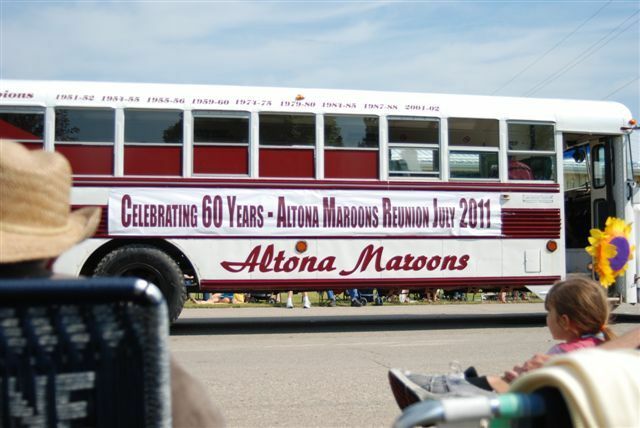 Mark your calenders - July 15-17 in 2011 will be the Maroons 60th reunion celebrations. Plans at this point include an optional Friday night bonfire/get together behind the new Sunflower Gardens. Saturday will feature registration, Breakfast, Golfing, Swimming and will come together with an evening dinner followed by a short stage show presentation followed by a dance in the arena. The celebration continues on Sunday with a breakfast and a brief service. A mailing has gone out to anyone who has ever played with or been part of the Altona Maroons organization. A stong database is in tact from the 50th reunion but of course people do move so we are hoping to gather information and update our database. ** UPDATE (April 12, 2011) Click on the "Maroons Alumni List" link on the left hand menu of the webpage to view the list of people that at one point or another have played for the Altona Maroons, volunteered on the Executive, coached minor hockey in the organization etc. The list is long, but it's possible that some names have been missed. If you find that a name should be on this list please send an email to mehild@mts.net.